GILLETTE, WY-- Peabody Energy shareholders affiliated with Powder River Basin Resource Council, Missourians Organizing for Reform and Empowerment (MORE), CO-FORCE (Coloradans for Fair Rates and Clean Energy), and Forgotten People from Black Mesa/Big Mountain in Arizona converged in Gillette, Wyoming, on Monday, April 29, 2013, at Peabody's Annual General Meeting. Peabody has always held its meeting near its headquarters in St. Louis, but moved it this year to avoid public scrutiny. 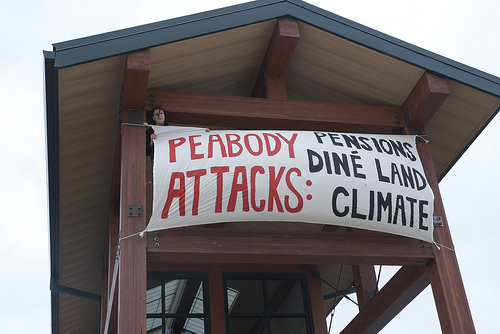 After the meeting, an activist affiliated with MORE [was arrested] dropping a banner saying, "Peabody Attacks: Pensions, Diné Lands, Climate." 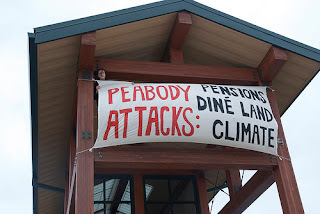 Shareholders asked targeted questions to CEO Greg Boyce and the Peabody Board of Directors regarding its current business model which consistently externalizes its costs to coal mine neighbors, workers, and the environment. Peabody's creation of now-bankrupt Patriot Coal to unload its pension and healthcare obligations to retired miners is a recent example of how Peabody disregards its own workers. Shareholders stood with the United Mine Workers of America (UMWA) in Gillette in demanding that Peabody pay its retired miners what they were promised, while thousands more rallied in St. Louis. 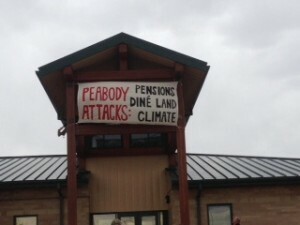 Just as Peabody is threatening the livelihoods of UMWA retirees, Peabody was also confronted today by two residents of the Black Mesa/Big Mountain area in Arizona. For decades, Peabody has been involved in the forced relocation of tens of thousands of Diné and Hopi on Black Mesa. 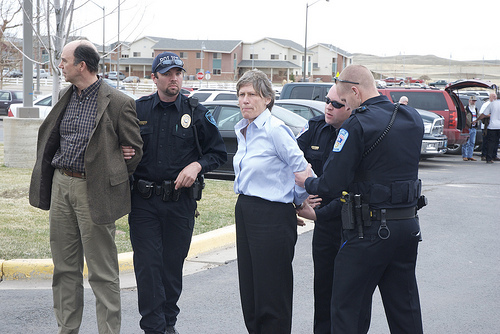 In January, residents of Black Mesa attempted to meet with CEO Greg Boyce in St. Louis. He refused, and twelve people were arrested attempting to deliver a letter from Black Mesa residents to Peabody. "This winter, we travelled to Peabody's headquarters in St. Louis to bring them a message from the people of Black Mesa, whom Peabody is displacing from their ancestral lands to expand their strip mines. Instead of holding a dialogue, Boyce hid behind security and hired police; now we have come to Gillette so that we can express our concerns face-to-face," said Don Yellowman, of Forgotten People on Black Mesa/Big Mountain in Arizona. Shareholders also drew attention to Peabody's attempts to cheat American taxpayers by leasing artificially cheap coal from the Bureau of Land Management. This practice is now under unprecedented investigation by the Government Accountability Office, the Department of the Interior, and Congress, and it could pose a large risk to the financial viability of Peabody's mining efforts in the Powder River Basin. Today, over 135,000 petitions were delivered to Interior Secretary Sally Jewell calling for a moratorium on new coal leasing in the Powder River Basin. The petitions follow an April 15 letter to Secretary Jewell signed by the leaders of 21 environmental, public health, consumer rights and community organizations calling for a moratorium and comprehensive review of the federal coal leasing program. "Peabody's chickens have come home to roost," stated LJ Turner, a Wyoming rancher who lives near Peabody's North Antelope Rochelle Mine. 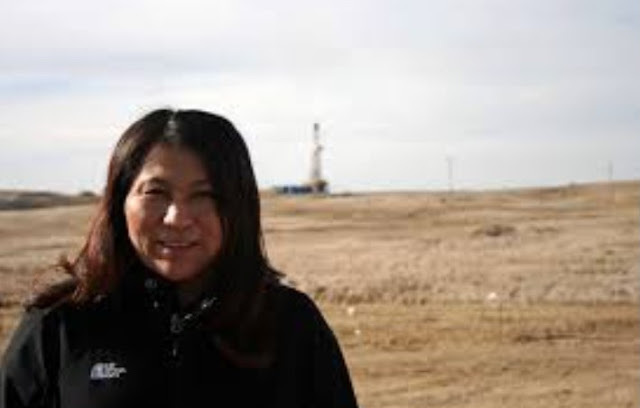 "For too long, Peabody has ignored the true cost of its coal mines in the Powder River Basin, but now Congress and others are starting to pay attention to the impacts of mining on people, our air and land, and the climate." Shareholders' concerns are underlined by a recent subpoena of Peabody by the Securities and Exchange Commission, related to the building and development of the Prairie State Energy Campus in Marissa, IL. Peabody, once the full developer of the project, sold of 95% of the plant to hundreds of towns and cities across the Midwest who are now paying for the plant's extreme cost overruns in their monthly bills.